In this fun packed week we will explore various techniques that will enhance and add a little sassiness to your work. Techniques to be covered include faceting, fluting, darting, and much more. Come with a playful attitude and willingness to take chances. Bisque firing only. Some basic throwing skills required. Linda McFarling attended Wesleyan College where she earned a BFA with a major in Painting. She has exhibited in galleries throughout the nation and has taught in several different workshops. She lives and works in Burnsville, North Carolina. My aim as a functional potter is making pots that honor the rich traditions of the past while hopefully adding to them. I am currently working with several different clay bodies, fired in a salt-soda kiln. I restrict myself to only a few slips and glazes. I find myself very inspired as well as challenged working within these confines: it allows me an intimacy and interaction throughout the whole process. My primary interest has always been in form. I want my work to show a strength and freshness from the making through the firing. I prefer to work in a style that lets one pot tell me what to do with the next. Each kiln load, while yielding exciting new pots, also gives me invaluable information for further refinement – slow, steady, always evolving. I especially try always to keep a playful, risky attitude in the studio. 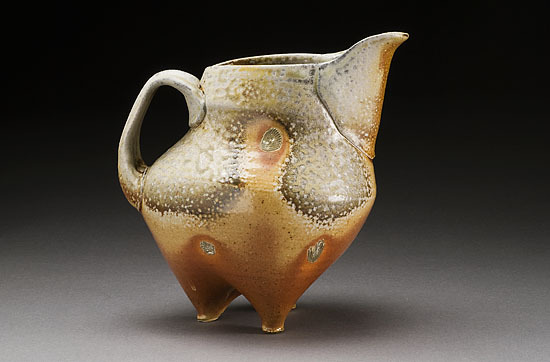 Most of my work is altered on the wheel using various techniques such as faceting, fluting, and darting in an effort to create soft, strong, lively vessels that reflect my intent. My whole purpose in making pots is to share with the user the joy I derive from this incredible creative process.